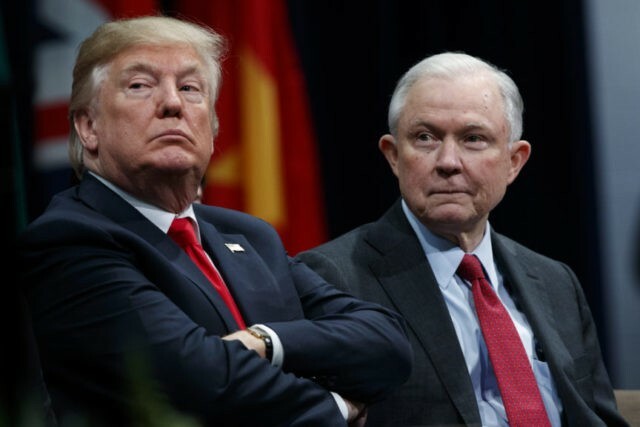 Attorney General Jeff Sessions begins 2018 with a series of wins for President Donald Trump, delivering on several issues in a way that few others could, to the applause of the president’s base. First is immigration. The fact that January has seen not one, but two historic immigration cases head toward the Supreme Court can be explained by one simple fact: In Sessions, President Trump picked an immigration warrior. Two blockbuster cases are likely to be taken up and decided by the Supreme Court in the same week this year. One is Trump v. Hawaii, the legal challenge to the president’s authority to fulfill his campaign promise of “extreme vetting” for immigration. The Court granted review in Hawaii on January 19. The other case is Department of Homeland Security v. Regents of University of California, the legal challenge to the Trump administration’s decision to end an amnesty program for 800,000 illegal aliens called DACA. When a leftwing federal judge in California declared that decision unlawful, Sessions not only filed an immediate appeal with the Ninth Circuit appeals court, he also took the extraordinarily rare and aggressive step of petitioning the Supreme Court to take the case immediately, before the Ninth Circuit rules on the case or even hears arguments on it. On Sessions’ behalf, Solicitor General Noel Francisco asked the justices to decide Regents of UC before the end of the Court’s term. The Court has accelerated the schedule, voting on February 16 whether to take the case. If the Court grants review, it will need to issue an expedited briefing schedule, then hear both immigration cases the last week of April, and will likely hand down both decisions in the last week of June. The attorney general showcased his conservative bona fides on immigration in a speech on Friday. Conservative Republicans are raving about his unapologetic defense of defending America’s borders and the rule of law. Second is draining the swamp. Millions of Americans who were already unhappy with the level of bias manifested in the text messages of FBI deep-staters Peter Strzok and Lisa Page were then outraged when told that five months of the illicit couple’s text messages had disappeared – months covering a critical time period in this scandal. Sessions vowed to find those texts by any means possible. On Friday, the Justice Department’s inspector general announced that his team successfully recovered the texts. This becomes the latest development in the attorney general’s proliferating investigations into potential wrongdoing concerning a number of scandals from the past several years. All this comes on the heels of a third issue for which the GOP base gives its highest marks for the president: Judges. Sessions successfully led the Justice Department’s part of confirming Supreme Court Justice Neil Gorsuch, setting an all-time record for first-year appointments to the federal appeals courts, with many more to come in 2018. Every president has multiple constituencies to keep in view in America’s democratic form of government. For President Trump, no one in the Cabinet is doing more than Sessions to solidify support among the president’s base.